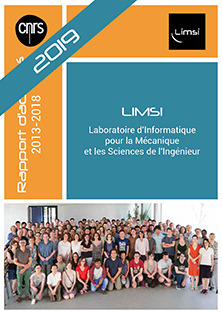 LIMSI, a strongly multi-disciplinarity laboratory, hosts researchers from Engineering Sciences and Computer Science, but also from Life Sciences and Social Sciences. Its scientific field covers Natural Language Processing, Human-Machine Interaction, Augmented and Virtual Reality, Fluid Mechanics, and Energetics. We share a common long-term goal, which is to improve the well-being of man in their surrounding environment, both from a material and immaterial point of view. Do robots have humor ? VIDA is a tranverse action whose mission is to coordinate research projects at the frontier of Science and Arts, with the collaboration of artists and designers. The simulation of realistic flows and analysis of experimental or numerical databases for geophysical, industrial or biological applications requires the development of numerical methods. The AERO group develops fundamental research on advanced numerical methods in the context of high performance computing (HPC). This work has led to the development of original methods for flow analysis, prediction and control. The emergence in recent years of new classes of users, new software and hardware platforms and new interaction environments and contexts (mobility) has shifted our attention from static interaction situations to open and dynamic ones. This is the reason why the AMI group focuses on post-WIMP interaction paradigms where the hands on experience of the physical world is important, such as tangible user interfaces to manipulate physical objects, tactile surfaces, or 3D interactions. Besides, ambient environments and augmented reality spaces provide the designers of new interfaces with new modalities and new requirements, thus enriching the traditional issues in multimodal interfaces. The goal of the CPU group (Cognition, Perception, Use) is to conduct pluridisciplinary research with the joint perspective from Psychology, Ergonomics and Computer Science in order to address research questions about (or that can be useful for) the design or evaluation of Human-Computer Interaction. The research activities of the ETCM group are devoted to the dynamics of external or internal flows by numerical, analytical and experimental methods. We are particularly interested in the study of flow instabilities, the transitional regimes or the turbulent tregimes of these flows. The sources of instabilities include mass or temperature gradients, the parietal friction, the interfacial tension, the Lorentz force, the thermo-acoustic coupling, phase changes, etc. To deepen the physical understanding of destabilization mechanisms, we develop cutting-edge numerical tools and are committed to a new experimental activity. ILES specifically addresses the analysis, understanding and production of written language, and the modelling and production of signed language. Natural language processing aims to process human language in such a way that the results of this processing make sense for humans, i.e., meet their expectations. It aims to design computer programs that can understand or emulate human communication, e.g. by analysing documents and extracting task-relevant information, helping in the production of documents (spell checkers, style checkers, controlled language editors), generating a whole document (text summarizer), or answering questions based on text or more structured content. The Spoken Language Processing group carries out research aimed at understanding the human speech communication processes and developing models for use in automatic processing of speech. With the aim of extracting and structuring information in audio documents, the group develops models and algorithms that use diverse sources of information to carry out a global decoding of the signal, that can be applied to identify the speaker, the language being spoken and the speaker affective state, to transcribe the speech or translate it, or identify specific entities. This research is by nature interdisciplinary, drawing upon expertise in signal processing, acoustic-phonetics, phonology, semantics, statistics and computer science. VIDA (Virtuality, Interaction, Design, & Art) is a transverse action at LIMSI supporting and promoting collaborations between engineering sciences and creative domains of contemporary arts (visual arts, dance, music, theater, and performance) including also design and architecture. VIDA activities gather members of various groups at LIMSI.